The baseball traces its origin to the game of the same name. Modern baseball evolved from the English game of "rounders" in the first half of the 19th century. Alexander Cartwright of New York formulated the basic rules of baseball in 1845, calling for the replacement of the soft ball used in rounders with a smaller hard ball. Despite its uncomplicated appearance, the baseball is in fact a precision-made object, and one that has often been the subject of heated controversy throughout its history. Although baseballs have changed very little in this century, either in terms of their physical dimensions or raw materials, some observers have suggested that the balls have secretly been "juiced up" to increase the output of crowd-pleasing homeruns during periods of lagging attendance at major league baseball games. The manufacturers of baseballs and Major League Baseball have steadfastly denied such allegations, however, and no proof of any covert alterations in the ball's design or composition has ever been produced. An official Major League baseball consists of a round cushioned cork center called a "pill," wrapped tightly in windings of wool and polyester/cotton yarn, and covered by stitched cowhide. Approximately 600,000 baseballs are used by all Major League teams combined during the course of a season. The average baseball remains in play for only five to seven pitches in a Major League game. Each ball must weigh between 5 and 5.25 ounces (141.75-148.83 grams) and measure between 9 and 9.25 inches (22.86-23.49 centimeters) in circumference to conform to Major League standards. Such uniformity was nonexistent in the early years of baseball's history, when balls were either homemade or produced on a custom-order basis as a sideline by cobblers, tanners and other small business owners. In 1872, the modern standard for the baseball's weight and size was established. The production of balls became more consistent during the remainder of the decade, thanks largely to the demands made on manufacturers by the newly formed National League, the first professional baseball league. At the turn of the century, the baseball had a round rubber core. This gave way in 1910 to the livelier cork-centered ball, which was itself replaced two decades later by the even more resilient cushioned cork model. The baseball has undergone only one significant change since that time, when a shortage in the supply of horses in 1974 prompted a switch from horsehide to cowhide covers. A baseball has three basic parts: the round cushioned cork pill at its core, the wool and poly/cotton windings in its midsection, and the cowhide covering that makes up its exterior. The pill consists of a sphere, measuring 13/16 of an inch (2.06 centimeters) in diameter, made of a cork and rubber composition material. This sphere is encased in two layers of rubber, a black inner layer and a red outer layer. The inner layer is made up of two hemispheric shells of black rubber that are joined by red rubber washers. The entire pill measures 4-⅛ inches (10.47 centimeters) in circumference. 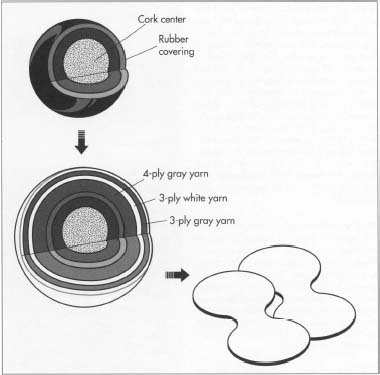 There are four distinct layers of wool and poly/cotton windings that surround the cushioned cork pill in concentric circles of varying thickness. The first winding is made of four-ply gray woolen yarn, the second of three-ply white woolen yarn, the third of three-ply gray woolen yarn, and the fourth of white poly/cotton finishing yarn. The first layer of wool is by far the thickest. When wrapped tightly around the pill, it brings the circumference of the unfinished ball to 7-3/4 inches (19.68 centimeters). The circumference increases to 8-3/16 inches (20.77 centimeters) after the second winding has been applied, 8-3/4 inches (22.22 centimeters) after the third, and 8-% (22.52 centimeters) after the fourth. Wool was selected as the primary material for the baseball's windings because its natural resiliency and "memory" allow it to compress when pressure is applied, then rapidly return to its original shape. This property makes it possible for the baseball to retain its perfect roundness despite being hit repeatedly during a game. A poly/cotton blend was selected for the outer winding to provide added strength and reduce the risk of tears when the ball's cowhide cover is applied. The baseball's outer cover is made of Number One Grade, alum-tanned full-grained cowhide, primarily from Midwest Holstein cattle. Midwest Holsteins are preferred because their hides have a better grain and are cleaner and smoother than those of cattle in other areas of the United States. The cover of an official baseball must be white, and it must be stitched together with 88 inches (223.52 centimeters) of waxed red thread. Cowhides are tested for 17 potential deficiencies in thickness, grain strength, tensile strength and other areas before they are approved for use on official Major League baseballs. The production of a baseball can be viewed as a process of placing successive layers of material (rubber, fabric and cowhide) around a rubbery sphere not much bigger than a cherry. These materials are placed around the small sphere in three distinct ways: the rubber is molded, the fabric is wound, and the cowhide is sewn. The placement of materials around the sphere is done under carefully controlled conditions to ensure that consistent size, shape and quality are maintained. 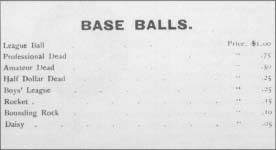 An advertisement for baseballs from the hade catalog of Horace, Partridge & Co., from about 1891. Baseball," wrote Mark Twain (Samuel L. Clemens), "is the very symbol, the outward and visible expression of the drive and push and rush and struggle of the raging, tearing, booming nineteenth century." Baseball initially evolved into a favorite American sport because it was faster paced and more physical than its English predecessors, cricket, town-ball, and rounders. Though cricket was played wherever English immigrants congregated in the United States, Americans seemed to prefer the more aggressive character of baseball. Initially played by gentlemen in fashionable clothing, the game and its equipment—and its popularity—began to change once rules were written down in the 1840s. In particular, the game gained tremendous popularity after the Civil War. The ball itself was changed at least twice in that century: the first ball was too lively (scores sometimes exceeded 100 runs); the second was too dead (a scoreless 24-inning game convinced many that hitters were disadvantaged). A. G. Spalding made headline news in 1888-89 when he led a widely popular tour of American baseball players that played demonstration games in countries around the world. By the turn of the century, Spalding was marketing four baseballs in boy's size and eight in regulation size, each costing from four cents to one dollar. 1 Two hemispheric shells of black rubber, each approximately 5/3 of an inch (.39 centimeter) thick, are molded to a sphere of rubberized cork measuring %, of an inch (2.06 centimeters) in diameter. The two small openings that separate these shells are sealed with red rubber gaskets. The first step in manufacturing a baseball involves molding two shells of black rubber to a rubberized cork. After a thin layer of red rubber is molded to the ball and a layer of cement is applied, wool yarn is wound around the ball. The yarn is wound in three layers: four-ply gray yarn, followed by three-ply white yarn, and finally three-ply gray yarn. A final layer of poly/cotton finishing yarn is next wrapped around the ball. The final layer is the cowhide cover, consisting of two figure-eight pieces that are stapled to the ball and then stitched together. 2 Next, a layer of red rubber roughly 3/32 of an inch (.24 centimeter) thick is molded to the black rubber encasement. The entire "pill" is then molded into a perfect circle weighing approximately ⅞ of an ounce (24.80 grams) with a circumference of roughly 4-⅛ inches (10.48 centimeters). Once the pill has been molded, a thin layer of cement is applied to its surface. This layer keeps the wool yarn in place on the pill at the start of the first winding operation. 3 Wool yarn, stored under controlled fabric temperature and humidity conditions, is wound around the pill. This is done by computerized winding machines that maintain a constant level of very high tension to eliminate "soft spots," and create a uniform surface. After each step in the winding process, the ball is weighed and measured by computer to assure that official size requirements have been met. The wool yarn is wound so tightly that it has the appearance of thread when a baseball is dissected. Three layers of wool are wound around the baseball: the first, 121 yards (110.6 meters) of four-ply gray yarn; the second, 45 yards (41.13 meters) of three-ply white; and the third, 53 yards (48.44 meters) of three-ply gray. 4 A layer of 150 yards (137.1 meters) of fine poly/cotton finishing yarn is wrapped around the ball to protect the wool yarn and hold it in place. The wound ball is then trimmed of any excess fabric and prepared for the application of the external cowhide covering by being dipped in an adhesive solution. 5 The cowhide covering is cut into two figure-8 patterns. Each pattern covers half the wound ball. Before they are stitched to the wound ball, the cowhide coverings are dampened to increase their pliability. The insides of the coverings also receive a coating of the same adhesive that was applied to the wound ball. 6 The two figure-8 coverings are stapled to the wound ball, then they are hand-sewn together using 88 inches (223.52 centimeters) of waxed red thread. There are 108 stitches in the sewing process, with the first and last completely hidden. An average of 13 to 14 minutes is required to hand-sew a baseball. 7 After the covers have been stitched together, the staples are removed and the ball is inspected. The ball is then placed in a rolling machine for 15 seconds to level any raised stitches. The baseballs are then measured, weighed and graded for appearance. Acceptable baseballs are stamped with the manufacturer's trademark and league designation. A statistically representative sample of each shipment of baseballs is tested to measure Co-Efficient Of Restitution (COR), using Major League Baseball's officially sanctioned testing procedures. Essentially, the COR is an indication of the resiliency of a baseball. The COR test involves shooting a baseball from an air cannon at a velocity of 85-feet-a-second (25.90-meters-a-second) at a wooden wall from a distance of eight feet (2.43 meters), and measuring the speed with which the ball rebounds off the wall. Major League COR specifications stipulate that a baseball must rebound at 54.6 percent of the initial velocity, plus or minus 3.2 percent. A baseball must also retain its round shape after being hit 200 times by a 65-pound (29.51 kilograms) force. 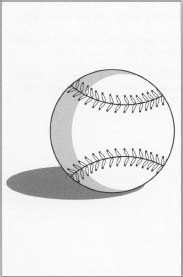 As proof of its strength, a baseball must distort less than 0.08 of an inch (.20 centimeter) after being compressed between two anvils. A finished baseball, with 88 inches of waxed red thread holding the two cowhide covering pieces together, weighs between 5 and 5.25 ounces and measures between 9 and 9.25 inches in circumference. few, if any, changes are expected in the process by which baseballs are manufactured. Attempts have been made to automate the process of sewing cowhide covers on baseballs, but none has been successful. Automated machines that have been experimented with have exhibited two serious problems: first, they have been unable to start or stop the stitching process without manual assistance; and second, they have been unable to vary the tension of their stitches, something that is essential if the two figure-8 coverings are to fit securely on the wound ball without tearing. It is also probable that the controversy about juiced-up balls will continue as long as the game of baseball is played and fans seek an explanation for fluctuations in the homerun output of favorite teams and players. Cleary, David Powers. Great American Brands. Fairchild Applications, 1981. Danzig, Allison and Joe Reichler. The History of Baseball. Prentice Hall, 1959. James, Bill. The Bill James Historical Baseball Abstract. Villard Books, 1986. Seymour, Harold. Baseball: The People's Game. Oxford University Press, 1990. Thorn, John and Bob Carroll, eds. The Whole Baseball Catalog. Fireside Books, 1990. "Batter Up for a Baseball Factory Tour," Southern Living. November, 1989, p. 34. Can you please tell me if the baseball made on 1994 and the one made on 2001 were made with the same specifications and the same material? if so howcome so many homeruns in the year 2001 and a lot less on the year 1993.